Cage tippers provide a safe means to contain and transport a payload of items which are simultaneously bulky but individually lightweight enough to be blown onto the carriageway when in transit. This is often the case with vegetation and green waste, or even litter and plastic debris. Now that the growth of the Summer has stopped, and trees and hedges have shed their leaves, many are deciding to clear their gardens and outside premises before the return of Spring. This time of the year is good for cutting back branches and pruning unruly shrubs or picking up debris from Autumn storms. Without the cover of vegetation, litter is now visible and can be collected and removed for recycling. But where the volume will exceed that of a normal tipper van, cage tippers are the answer. Whether you are a homeowner looking to clear your garden before Winter really sets in. Maybe you are a private landlord with a property portfolio to maintain. Or perhaps you are a big commercial venture with a large site to tidy. Local authorities and public sector organisations may need to draft in extra resources as part of the big clean up. 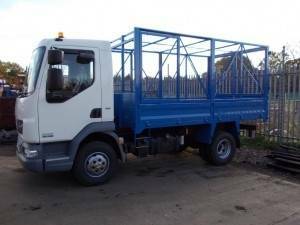 Cage tippers are available to hire on a short or long term basis, and we can make life much easier for our customers by delivering and collecting the cage tippers at the end of the hire period. With ND Brown depots located strategically around the United Kingdom, you’re never too far from the commercial and HGV vehicle resources you need. The complete solutions to your hot box, hgv hire, grab vehicles, tipper hire including cage tippers and more is all here at ND Brown. From a single vehicle to multiple lorries, hot boxes, 4×4’s or specialist vehicles like road sweepers and gully emptiers. ND Brown can devise the hire solution for you. Our team of experts are on hand to discuss your requirements further, so please contact us today.